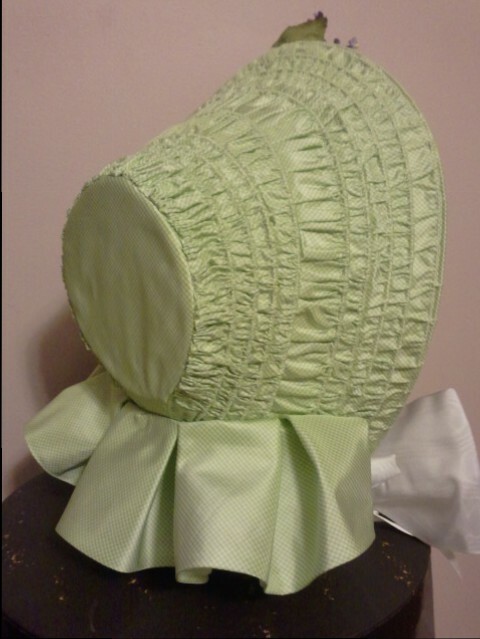 Green Mini-Check Silk Drawn Bonnet. 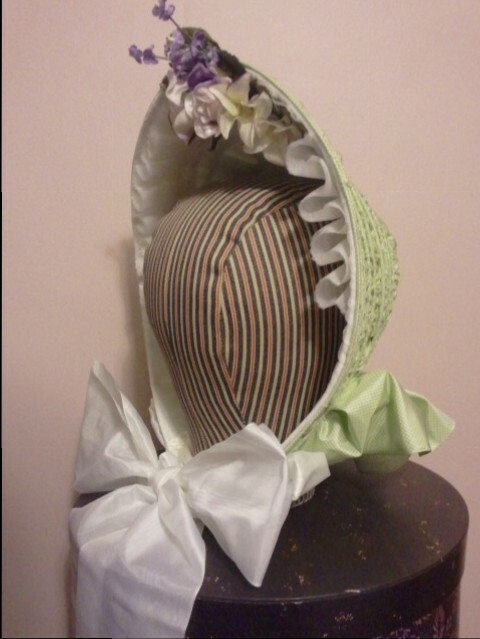 The form for this bonnet has been sitting on the work table since mid-summer, with the silk patiently waiting. For this piece, I wanted to play with the texture created by placing the drawn canes evenly together, following the curving shape of the brim. I used the thicker of the canes to play off the tiny check. I found this really emphasizes the curve of the brim and visually elongates it. I love how that works. The decorative ribbon is the German moire I like in white. 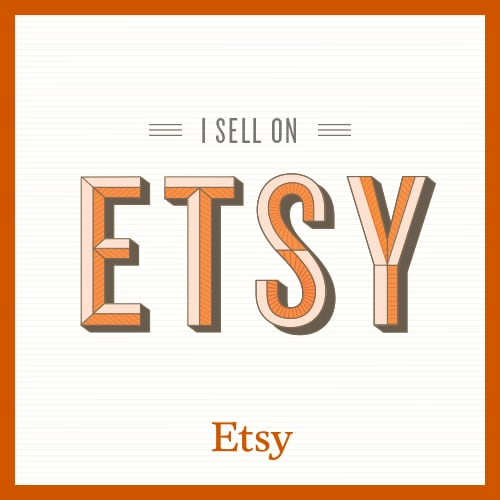 It makes for a nice, wide ribbon that ties beautifully and lasts. The functional ties are silk satin, in ivory. I set the organza frill high and slightly asymmetrically. Part of me wants to fill in the sides all the way through the cheektabs. But, this placement is supposed to emphasize the vertical line and height. Now the flowers. As I worked with the silk, I knew it really wanted purple. I found a pair of pretty purple velvet roses and delicate white lilies whose edges have just a hint of purple. The spray of velvet blossoms add to the height. 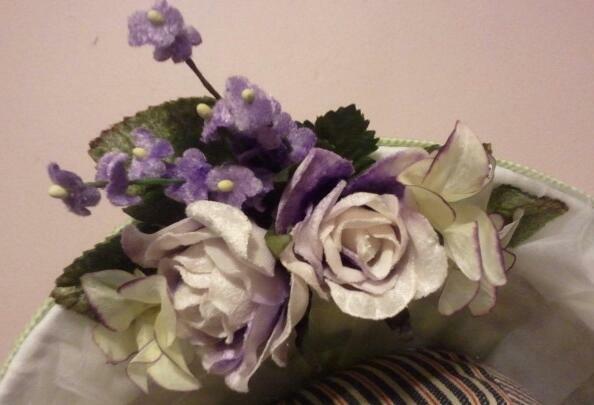 I went with a small bouquet set asymmetrically. Almost forgot. 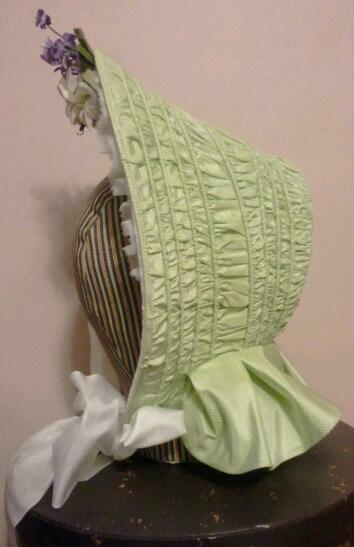 This bonnet is available on Etsy.